Do your research, make your windshield money count. Do you need a new windshield because yours is cracked? What is your main requirement for selecting an auto glass replacement company? How do you select your windshield replacement company? What do you know about the company that is going to or did your replacement? What is the reputation of your auto glass company? Do you care? What if you were having surgery, would these questions matter to you? Would you even give them a thought? Now I am not comparing auto glass repair or windshield replacement to surgery but I am attempting to make a point that you need to ask questions other than “How much is it” and do research on how a company does business and performs their service. I am constantly getting calls asking if I am able to fix a loose molding or reseal a leaking piece of glass that another company installed. Why am I getting these calls? 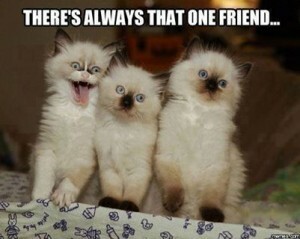 Here are 3 reasons that I hear all of the time. 3. I do not want them touching my car again, I do not trust them. If the installer did not use primer, did not run a consistent and solid bead of urethane or a variety of other things correctly, than the only way to fix the leak is to remove the windshield and start from scratch…. which will cost you more money if you go with someone other than the original glass company. Very seldom will you be able to remove the windshield without breaking it in the cars of today, which is why the warranty and guarantee is very important to you the consumer. Doing a small amount of research for reviews online will yield vast amounts of information, and at the same time LEAVING reviews online could/will help the next person come to a decision and perhaps avoid trouble. And as much as it hurts to admit and accept, paying a little more on the front end for a company that does not take shortcuts and follows procedures, usually ends up SAVING you money in the long run. Most people think of the windshield as the part of the car that prevents them from getting hit in the face by bugs and rocks as they drive down the road; but in reality, it serves an even more important purpose. The windshield is a primary component of your vehicle’s safety feature. In addition to protecting the driver and passengers from flying debris, the windshield helps support the car’s roof, and is a major component of the passenger safety restraint system. Along with the seatbelts and airbags, it helps keep the driver and passengers inside the car in the event of a crash or rollover. However, if the factory-installed windshield has been replaced and the work was not done properly, it could lead to problems. According to the National Highway Traffic and Safety Administration (NHTSA), more than 30 percent of the 40,000 Americans killed in highway fatalities every year — some 12,000 people — die after either being ejected from the vehicle, or critically injured during rollovers. “The National Glass Association’s (NGA’s) review of the NHTSA data confirms a measurable percentage of those fatalities occur when an improperly replaced windshield does not remain firmly bonded to the vehicle during a crash. Unfortunately, the percentage is probably higher than we can document but, often, accident investigators are unable to identify the ejection pathway after the fact,” says Leo Cyr, vice president of the National Auto Glass Association’s Auto Glass Division. A “20/20” news story that aired on February 25, 2000, supports that theory. “20/20 experts estimate up to 70 percent of the 12 million windshields replaced each year are done so improperly. Among the mistakes made by unlicensed technicians, not cleaning the new windshield properly before attaching it to the car; not wearing disposable rubber gloves when handling a windshield, allowing natural body oils and dirt from their hands to contaminate the bonding surface; skipping the secondary primer for the windshield, preventing it from fully bonding; using Butyl tape instead of urethane as the bonding agent; and failing to warn the customer that the car is not safe to drive until the adhesive cures. The NGA has calculated that 5.1 percent of windshields are damaged and require replacement each year. With people keeping their cars longer than ever these days, the chances that you’ll need a windshield replacement are good. the windshield’s inner PVB layer has not been penetrated and compromised. reception area of the Glass shop. 2. Ask if your service provider employs technicians trained and certified? an hour, make sure to ask what urethane they are using and ask to see documentation of cure time. sending it out on the road. I have spent over 20 yrs in the auto glass business and as you can imagine I have seen and heard many things over that time. Some things you brush off or roll your eyes at while others make you shake your head and pull your hair out. Recently I have had a couple of experiences I would like to share with you. A few days ago while picking up some parts from the local supplier I overheard an “installer” ask another “installer” how to install a back glass he had just purchased. The answer he got was to “LOOK IT UP ON YOUTUBE, THAT IS HOW I LEARNED”. Now you my think to yourself I look stuff up all the time on youtube, whats wrong with that? A lot. I decided to visit youtube and see what kind of instructions they provided for auto glass installations. While many of the videos did “show” you how to do the replacements, few showed the proper steps and none that I watched addressed the safety aspect of the installations, proper cure times, proper steps for using primers or most importantly addressing the Safe Drive Away Time (SDAT) which can vary from 1 hr to as much as 72 hours depending on which urethane you use and/or temp and humidity. Another situation is something that I am continually fighting, and will continue to fight, and that is the lack of knowledge among people outside of the industry regarding the function and importance of your windshield. I am constantly asking people on my sales calls if they are aware of the Safe Drive Away Times or if anyone has ever mentioned this to them. The overwhelming answer I hear is “No, no-one has ever told me that” or “The last installer told me I could drive as soon as he was done”. Did you know your windshield is a vital part of your vehicle structure? Did you know you CANNOT drive your vehicle right away after a replacement? Lastly, lets think for a moment….. If you call around to different glass shops and several of them say it will take 2-3 hrs. (for argument sake here) to do the replacement and release the vehicle, what makes you think that someone who says it will take 30 minutes and you can drive right away is doing the job correctly and not putting your safety and life at risk?? Friends!! 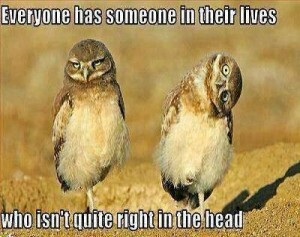 Haha, we all have them!! Friends!! Haha, we all have one or two of them!! 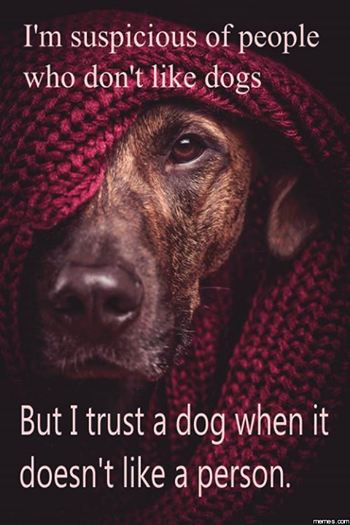 Dogs, do they know more than we give them credit for? 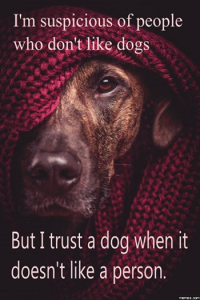 Dogs are one very much in tune with us more than we know…. or care to admit in some cases. We have sniffed out the competition, and we can save you money and deliver a quality auto glass repair or replacement. Safety glass is used in all automobile glass. It is manufactured to reduce the likelihood of injury, if it breaks. Windshields are made from a lamination process. The windshield glass in your car is made of laminated glass, which is designed to offer highest levels of safety in the event of a crash. The laminated glass is made up of two pieces of glass, with a thin layer of vinyl between them. The three pieces are laminated together by applying heat and pressure in a special oven called an autoclave. When a small object strikes a piece of safety glass, typically only the outer layer of the windshield that is struck breaks. However, in severe impact situations, the glass “shatters” but usually does not fly apart because the broken pieces of glass generally adhere to the vinyl inner lining. The side and rear windows are made of tempered glass, which is produced by heating the glass to more than 1,100°F and then rapidly cooling it. This “tempering” process makes the glass many times stronger than un-tempered glass of the same thickness. If broken, tempered glass is designed to disintegrate into small pieces of glass about the size of rock salt. There should be no large, jagged pieces of glass to injure the driver or passengers. Every part on a new car, comes from the original equipment manufacture (OEM), including the windshield. This glass meets the original specifications for safety and quality as the glass that it came with from the factory. An OEM replacement windshield is produced from original equipment-style tooling. This type of windshield will have the appearance of your car’s original windshield and will insure proper fit in the window frame reducing noise and leakage problems. You’re on the road this summer and a rock bounces up and puts a big crack in your windshield. No big deal, you can you wait until winter to fix it, right? No. A car’s windshield acts as one of its most important safety features during an accident, rollover or collision. In a collision, a properly installed windshield keeps you in the vehicle and acts as a backboard for the passenger side airbag. In a rollover accident the windshield supports the roof of your vehicle and prevents it from collapsing and injuring the vehicle’s occupants. Okay, so it’s time to replace the windshield, but what are the choices and how important is this really? There are two types of auto glass: OEM glass (Original Equipment Manufacturer) and non-OEM glass, or what many people refer to as aftermarket glass. OEM suppliers are trusted by auto manufacturers like GM, Chrysler, Toyota, Ford, etc. to provide quality controlled windshields that are a perfect match and fit for their vehicles. OEM glass suppliers spend hundreds of millions of dollars in research and development, using computer-assisted engineering and design programs (CAE and CAD) to ensure quality windshields for their vehicles. Each OEM windshield goes through rigorous and thorough surface contour and optical quality checks as it moves down the assembly line. Auto glass parts produced by OEM Manufacturers consistently fit better and adhere to the same standards for fit and finish as the glass that is originally installed when the car is built. There are significant quality differences between original equipment manufactured windshields and aftermarket auto glass. So why then, would anyone go to a shop that uses aftermarket glass when you need to replace your windshield? The after market shops will tell you that their product is the same quality as an OEM windshield. Wrong. Non-OEM auto glass manufacturers make copies of OEM auto glass parts. These copies have to vary slightly from the OEM part due to the fact that OEM parts are patented and the designs are protected and trademarked. Non-OEM suppliers must make significant differences in their product so that they do not exactly copy the glass used by GM, Chrysler, Toyota, Ford, etc. to avoid being sued for copyright fraud. Many auto glass shops use non-OEM parts because they are significantly cheaper to buy. These savings are not always passed along to the consumer, nor is the consumer told the parts being installed are of a lesser quality. Aftermarket glass parts also are not accepted by new car manufacturers for warranty claims and violate the repair requirements of many leasing contracts. It is common after installation for non-OEM or aftermarket parts to have fit and finish problems like air leaks, water leaks and stress cracks. Never replace your wipers again !? This would be a great improvement over buying new wiper blades every couple of months. McLaren, maker of the famed F1 supercar of the 1990s, as well as the modern-day 12C and P1, told U.K. newspaper The Sunday Times that it is currently working on a windshield that uses military-derived technology to clear rain and road debris from the windshield without the use of a wiper. How might a wiper-less windshield work? Theoretically, high-frequency sound waves would blast water droplets and other debris from the window. I asked [a military source] why you don’t see wipers on some aircraft on when they are coming in at very low levels for landing. I was told that it’s not a coating on the surface but a high frequency electronic system that never fails and is constantly active. Nothing will attach to the windscreen. The benefits of such a system are numerous. Aside from increasing driver visibility, McLaren’s wiper-less windshield will eliminate the added weight and energy consumption of windshield wipers, helping tighten lap times at the track and increase fuel economy on the streets. But if McLaren’s yet-to-be unveiled system replaces the traditional wiper with sound waves, as some have speculated, it’s likely the technology will fail to meet the standards set by FMVSS 104. The National Highway Traffic Safety Administration informed HuffPost that it considers revising safety standards when its own data and research indicate a needed change, or if a petition is filed asking for a change. Such a petition has yet to be filed regarding the standards set out by FMVSS 104, the Safety Administration said. As ludicrous as it seems that this regulation may prevent McLaren’s non-wiper tech from entering the U.S., other innovative technologies have been excluded from the U.S. market for similar reasons. Audi, for one, is hoping the Safety Administration will overturn a regulation requiring all cars to offer headlamps with both high and low beam settings. The company’s Matrix LED headlights, which Bloomberg Businessweek describes as “being made up of numerous LED bulbs that dim or brighten individually based on what cameras and sensors in the car see ahead,” aren’t currently offered on U.S.-market Audis, though they are available elsewhere, due to the fact that the system is dynamic and does not offer the dedicated high and low beam settings U.S. regulations require. Chapman Auto Glass & Windshield Replacement Services Keeping you informed. I thought I would post this and remind everyone that these types of things happen more than you would think and can happen right here in New Mexico. ALBUQUERQUE, N.M. —As if battling winter driving conditions wasn’t tough enough, one New Mexico man said he’s now dodging rocks as well. The drive along Interstate 40 took a different turn Wednesday for Pablo Baca when a large rock came crashing through his window just before rush hour. The rock came from a pedestrian crossing above the highway. Baca said he believes a group of kids tossed the rock onto his car. “I hope they pay for it somehow,” Baca said. Luckily, he and his wife are OK.
Has a car wash or quick lube approached you about windshield repair? This is very prevalent in the southwest because of the sand storms, rural areas and consumers being unaware. Do you ever wonder: If it is free, why do they require me to have Insurance? Remember: If it sounds to good to be true, it probably is! LAS VEGAS – Windshield damage happens frequently in Las Vegas. Chips, cracks and worse occur when rocks and debris hit your windshield. Scam artists are trying to capitalize on the threat of windshield damage. The scammers are accosting drivers at car washes and gas stations and telling them their windshields need repair, even if they don’t. The scam is so prevalent, it even has a catchy name: windshield bullying. According to industry experts, these scammers will bully people into getting work done. They use scare tactics such as saying the victim’s safety is in jeopardy. Once these scam artists have played on their victim’s fears, they make their sales pitch. This unnecessary service may not cost you a dime at the time, but in the long run, all insured drivers pay, because this is insurance fraud. “The more claims the insurance companies pay up, everybody has to pay more insurance. They aren’t in the business to lose money, and they won’t,” Parker said. Your premiums go up every time someone commits insurance fraud. The crime is becoming increasingly common. In states like Florida, Arizona and California, insurance fraud is a rampant problem. Experts say it’s only a matter of time before Nevada sees an increase in fraudulent activities. Many people in Las Vegas have already experienced windshield bullying. 8 on Your Side conducted an undercover investigation where these acts allegedly occurred, but was not solicited. For Albuquerque Auto Glass Repair call Chapman Auto Glass today!